Figuring out whether our new vinyl replacement windows would meet local building codes and fire codes was one of the biggest challenges we faced. We often heard different stories from the various sales people who gave us estimates. One of the first things you should consider when doing any type of remodeling is whether you will need to get permits from your local building department. All of the replacement window companies we considered agreed that permits were not required because the original window openings were not changing in size. If you want to enlarge a window, it's more likely you'll need to pull permits. Since building codes vary greatly, you'll need to check with your local building department if you want to be sure everything is up to code. 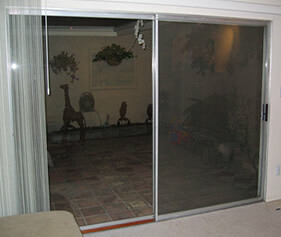 Old patio doors that lack tempered glass can be a safey hazard. All of the companies who gave us estimates agreed that our sliding patio doors would have to be tempered glass, also known as safety glass. This is the kind of glass you find in car windshields that shatters into tiny pieces when it breaks. It's much safer than regular glass which can break into dangerous knife-like shards. You can see why patio doors would need tempered glass since pets, children and even adults are more likely to run into them. Tempered glass is more expensive, but we're glad to have it. We were always worried about what could happen if our young daughter ever had an accident with our old patio doors. We were surprised to learn that patio doors aren't the only things that need to have tempered glass. Our local codes require that windows close to exterior doors and windows that are close to the floor also be tempered. Apparently windows close to an exterior door are more prone to break when the door slams. And windows close to the floor have the same problem as patio doors—people and pets may run into them. Again, you'll need to contact your local building department to find the rules for your area. We got tons of conflicting information about fire codes as they relate to vinyl replacement windows. Apparently, the current codes in our area require that window openings be big enough for a fire fighter in full gear to easily enter all of the bedrooms in a home. If you live in an older home, your original windows may not meet the new codes. That's usually not a problem until you replace those old windows. Once you install vinyl replacement windows, some states or municipalities may require that you bring everything up to code. One sales person pointed out that the sliding windows in our master bedroom were too small to meet the fire codes since half the window opening is blocked by the stationary part of the window. Her solution was to replace the sliders with awning windows, the type that hinge at the top and open with a crank from the bottom. We didn't really like this idea since all the rest of the windows in the house would be sliders. Of course, we asked the other sales people about this. They all said or implied that the codes weren't that strict and we could replace our old sliding windows with new sliders. We never got a definitive answer and we chose to get new sliders. I suppose this could come back to haunt us when we sell the house, but the risk seems very low. Once again, you should check with your local fire and building departments for information about the codes in your area.